JonathanLee Architects (JLA) is breaking new ground in modular construction. Backed by decades ofexperience in residential design and years of research and development, JLA ispioneering new means and methods that save time, conserve resources andminimize waste. The goal—create a one-stop-shop thatcan produce beautiful, efficient, functional spaces more quickly and moreaffordably than traditional construction methods can. To that end, JLA is collaborating withAngelo Adamo Design of Traverse City. Angelo is an accomplished designer with akeen eye and a profound understanding of interior spaces and how we experiencethem. A first-generationItalian/Australian, Angelo has established a design philosophy based on the scienceof perception using his modernist approach toward comfortable living. Angelo encouragesmeaningful and harmonious environments by fusing emotions to texture, color andscent. Component Homes by JLA & Interiors by Angelo Adamo Design – A new way of living. 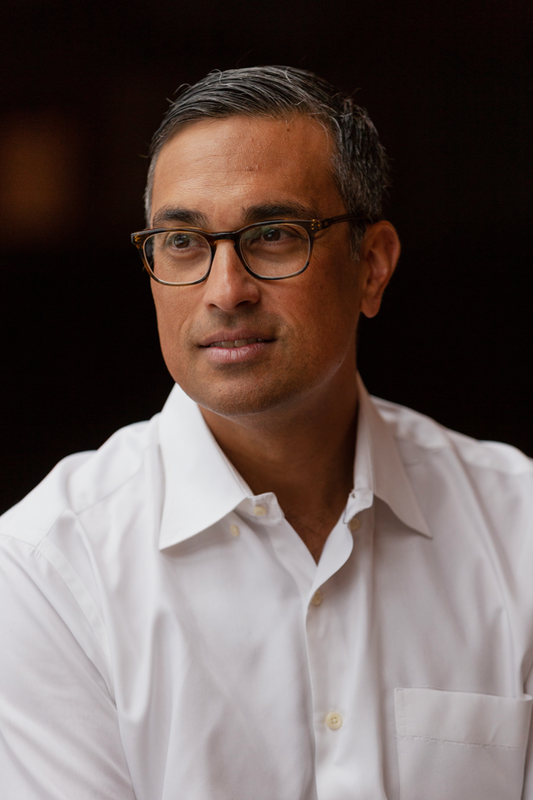 Together, JLA and Angelo AdamoDesign are transforming an industry—changing not only the way we build, but theway we think about design and the role it plays in our lives. Syracuse, IN – POLYWOOD, the originator of outdoor furniture made from recycled plastic materials, officially introduced their Design Ambassador Program for 2019. The company has collaborated with three prominent interior designers who will pair their own unique styles to create beautiful outdoor spaces with POLYWOOD furniture. Farah Merhi, Founder and CEO of the Inspire Me! Home Decor Brand, the most followed home decor platform on Instagram. Designer of the Inspire Me! furniture and home decor line. Influencer, Entrepreneur. To follow along and be the first to see behind-the-scenes content, follow @polywoodoutdoor on Instagram, Facebook, and YouTube. In the late 1980’s government mandated recycling programs were in full swing. As the use of plastic in the U.S. grew, the need to transform the overabundance of recycled plastic into something new was greater than ever. POLYWOOD saw an opportunity in high-density polyethylene (HDPE) plastic specifically — an extremely durable and weather resistant material, perfect for outdoor furniture. Today, POLYWOOD recycles an average of 400,000 milk jugs per day. Truckloads of recycled milk jugs are transformed into genuine POLYWOOD lumber which is then used to construct the wide array of POLYWOOD Adirondack chairs, rocking chairs, benches, gliders, deep seating, dining, and more! The Las Vegas Furniture Market (LVMkt) has become the modern interpreter for natural aesthetic and luxury living furnishings and home décor. LVMkt is an exciting and informative event that’s simple to navigate. This was my second show as the “Fresh to Follow” and “Instagram Takeover” designer for International Marketing Center (IMC), who is the owner and operator for the market. Discovering new products is important as to getting to know the people behind the brand. For example, Lily from Lily’s Living who is from Beijing, China, has over 20 years of experience as an antique dealer. She is so passionate about her culture. Her goal is to represent Chinese antiques using a European weathered influence so that her products aren’t as bold or rigid as original antiques. She has a wonderful perception for culture and the ability to mix styles and traditions. As a designer, I am looking for rich subdued hues, soft and warm tones, lush natural materials, and interesting patterns. It’s also important to me to connect with the owner or director so that their products become more then just an object or thing. What I have noticed about this market is that it isn’t just about furnishings or home décor. It is also about the people. Interior Design should be a reflection of who you are. An interior space shouldn’t be a trend but rather a testament to your emotions and values. Eric and Jenny from St George, Utah created “You Be Are” in 2013. They offer the best of topic art with modern and tradition settings like my favorite, the Blue Agave. The composition of clean backgrounds with vibrant subjects can be applied to many styles of interiors. Self adhesive wallpaper is genius! Great for apartment living or rentals. Adding texture to a wall is no longer a hindrance. Twin sisters from New Jersey, Jennifer and Julia, started Tempapar in 2009 and have influenced designers in wall patterns and textures. My favorite is L’AMOUR in metallic gold and white. It’s so inspiring to hear about two teen sisters, Isabel and Caroline, that created a booming business called daBOMB. Each fragrant fizzer is made by hand in the USA and has something fun inside when dissolved. It smells great too! My kids are now going to enjoy taking baths. Handley Drive provides quality inspired interior furnishings. Business partners, Rick and Don, design furniture that’s to human scale, ideal for urban apartment living. The attention to detail is impeccable and their use of color is soothing and attractive. Lily’s Living is where the influence of antiques in the east meets the weathered finishes of the west. Her furniture is comfortable, especially the Naples slipcover sofa with whitewash linen fabrics and contemporary piping. Products also range from traditional Chinese pottery to farmhouse lighting. Meeting Claire Summers, who is also an Aussie, was such an heartening moment. She founded Gratitude Glass Jars, an act that allows you to capture the spirit of living, celebrating life events, sharing memories and expressing words of love in jar. Such a brilliant idea that administers a better way of life and a use for a jar! Currey & Company still leads the way in lighting fixtures. You can find materials like marine rope, brass, stained glass, metal, natural woods, and porcelain. Products are appealing because most fixtures are perfectly scaled for either large or small rooms. Great use of mixed materials is a highlight as well. I was impressed with Feizy handmade rugs. Inky charcoal warm beige and inviting ivory create an approachable neutral palette in the Phoenix Collection. Handwoven of wool and cotton these tonal flatweaves feature easy-to-decorate with geometric motifs that seamlessly integrate into transitional and contemporary spaces alike with alluring textures that add intrigue. Everything about Palecek is stunning. Their distinctive furniture, lighting, and accessories are amongst the most beautiful and elegantly manufactured. The use of natural materials is incorporated throughout their product line. Bungalow 5 has the best of metropolitan style furnishings. The new Hunter collection takes its inspiration from a neo-classical design using fine leather and custom-cast metal fixtures and hardware. I was fortunate to be a participant of the “Fresh to Follow” panel with the talented Breegan Jane and Jannicke Ramso. It was a productive session because the crowd asked questions on how to get an edge into todays interior design market. I think the common thread to become a competitive designer is to understand your values and evaluate your strategies towards branding. We all understand that styles and trends are subjective. What’s necessary is to develop a storyline that the client can relate to and live with. It would also help to attend the LVMkt and introduce yourself to new creative ideas and the people involved. Thank you for reading my updates from the Winter Market 2019 and please feel free to contact me if you have questions regarding this blog. 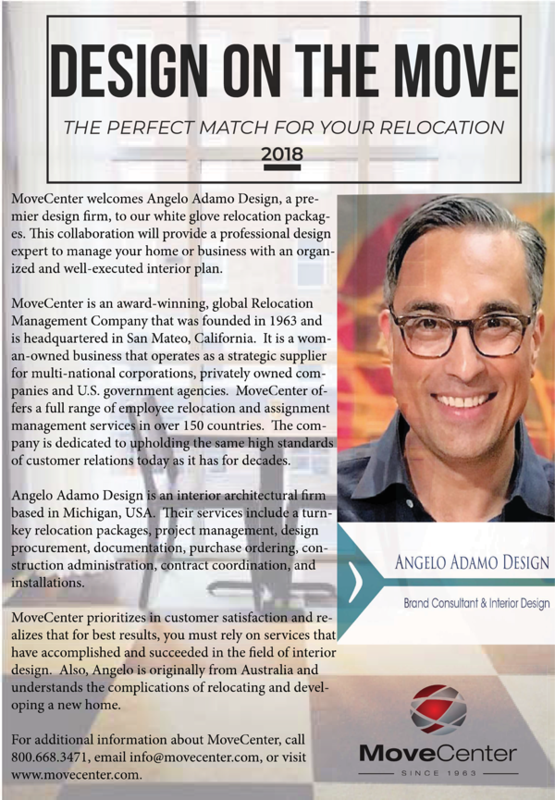 MoveCenter welcomes Angelo Adamo Design, a premier design firm, to our white glove relocation packages. This collaboration will provide a professional design expert to manage your home or business with an organized and well-executed interior plan. MoveCenter is an award-winning, global Relocation Management Company that was founded in 1963 and is headquartered in San Mateo, California. It is a woman-owned business that operates as a strategic supplier for multi-national corporations, privately owned companies and U.S. government agencies. MoveCenter offers a full range of employee relocation and assignment management services in over 150 countries. The company is dedicated to upholding the same high standards of customer relations today as it has for decades. Angelo Adamo Design is an interior architectural firm based in Michigan, USA. Their services include a turnkey relocation packages, project management, design procurement, documentation, purchase ordering, construction administration, contract coordination, and installations. MoveCenter prioritizes in customer satisfaction and realizes that for best results, you must rely on services that have accomplished and succeeded in the field of interior design. Also, Angelo is originally from Australia and understands the complications of relocating and developing a new home. For additional information about MoveCenter, call 800.668.3471, email info@movecenter.com, or visit www.movecenter.com. It’s that time of year when you start to reminisce and think about your accomplishments. Personally, I am excited that this was a year of change which I find cleansing and uplifting. With changes comes challenges but it’s these moments when you take more risks and create opportunities that are foreseeable. This year, I discovered that my position as a designer is to create memories for others that affect their senses, positively and emotionally. Design to Create Memories is the topic I presented during the Las Vegas Furniture Market in July. it’s about design that’s more than just an object or a thing. It’s the ability to connect with your senses that are conjoined to memories that have an emotional reaction to an inside space. This has led me to Hometherapy. It’s a brand I will be launching in Michigan that specializes in color, texture, and scent. These are the 3 areas that I am able to lead because of my science background, my experiences in Australia and the USA, and as a first generation Italian Heritage which nourished my passions for interior living. Streaming music, downloading interiors, and tracking fashion via social media, is forcing a louder voice for individuality and purpose. There is a no longer a right or wrong with what you sing, wear, or design but how you formulate a harmonious trend or note that people can relate. One of my design theories that I have discovered is that music is an influential factor to how we present ourselves with fashion. If you follow fashion, you notice clothing as an intrinsically motivated source for material and finish selections in the industry of interior design. Therefore, this is why I close this year with a song. It’s an R&B single by an young artist called Lucky Daye from New Orleans. The official song clip from YouTube (see link below) is charismatic, whimsical, cool, stylish, and colorful. It’s a great example of how a musician is taking all of the convoluted emotions of his childhood and early adulthood, and leaving them all on wax. This raw energy is what captures ideas of expression and has inspired me into finding my own voice.